Discussion in 'The War at Sea' started by Tonym, Sep 7, 2007. 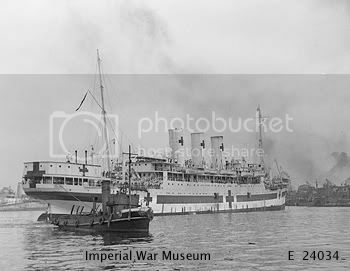 Can any member offer photographs of Hospital Ships 'Newfoundland' - 'Talamba' and 'Amsterdam' or advise please where I can locate them. No luck on Google. Newfoundland, so far, is only turning up a Cruiser, and searching for Amsterdam is being queered by a certain Dutch city. Searching for HMHS on there turns up lots of entries, you just might spot one of them there. AMSTERDAM official number 161037 mined 7/8/1944. Hugh, the unliveried ones are OK but can always be changed should liveried ones materialise. Hope this is the one you are looking for! Here is one of Talamba without the IWM mark. Does that sound like 'Thanks' in Aussie? 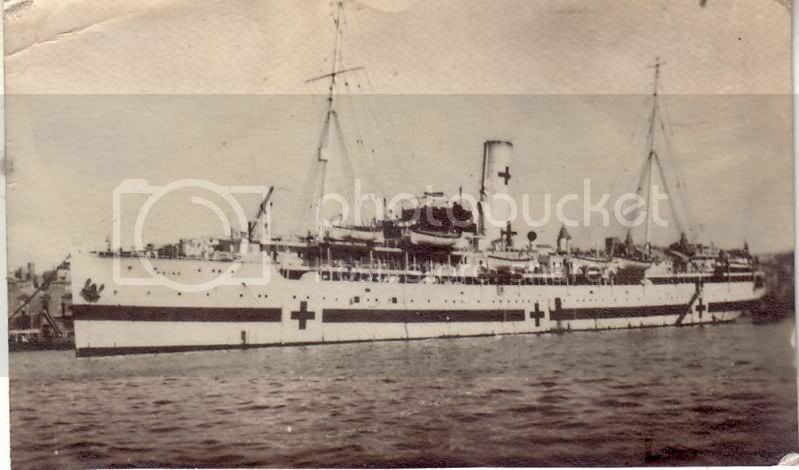 Does anyone have a picture or any information on the hospital ship 'St. David'? One of my ancestors was Chief Engineer and was awarded the OBE from George VI. The story is that he helped free the ships fouled screws while the ship was at Dunkirk during the evacuation. Had a look and presumably she's the 'St. David' built in '32 and sunk at Anzio in '44? Seems from here that she was sunk by an HS293 glide bomb, quite uncommon, though perhaps not at Anzio as it seems a few were thrown about. 96 lives lost and one of the attacking planes shot down by liberty ship 'Bret Harte'. There's a couple of 'peoples war' references to her too (one of which refers to a Capt. Thompson, Dunkirk GC winner who later went on to serve on the St. David). Can't seem to find reference to her presence at Dunkirk or a picture of her I'm afraid, or even one of her sister ship St Andrew. and a standard upload box will open in another tab or window. Just like GWF's, select the file/files and upload. Once back at the posting window click the small arrow next to the paperclip and whatever you've attached, whether several files or one , will be ready to be inserted wherever you wish by clicking on the name. Pics uploaded like this will appear as clickable thumbnails. To produce pictures more directly from the web, either copy their url or upload them to a hosting site like photobucket (better way to go), you can then use the 'insert image' icon to insert the url. (though most hosting sites allow you to skirt this step by giving you the direct 'IMG code' that you can paste straight into your text and the forum will recognise it). Hope that makes sense... I'm not so sure on rereading :mellow:. Sorry about that Adam. I thought it a bit strange that I was the only one with a photo. Still I now know how to post a picture, thanks. I have just noticed that someone in this thread was looking for a picture of the Hospital Ship St David. This was taken during 1939.
spidge, I'm a new member, I've been searching for a picture of HMHS Newfoundland for a very long time, my late farther was second cook aboard her, he told me all about the bombing and the resultant fire not long before he died, so many thanks for posting it, and my thanks to Hugh Maclean for the pictures of her before her new livery. My only disappointment is mother never got see a picture of the Newfoundland, she died two months ago aged 96 having never seen any of fathers war time ships. My thanks also to von Poop for the e-mail greeting unfortunately my pop up blocker seems to have done just that blocked it. I found this photo is a wallet belonging to my grandfather.